Your thinking is pretty much spot on. Bike lanes are mostly a placebo. That’s why the the best practice put on by Danish Copenhagenize says they are ok for speeds ~30mph. Anyting more than that and you need a segregated bike path – separated from traffic by a curb. I think you’re misreading the chart. The graphic is in KM, not MPH. 30 KM is about 18 MPH and well below the speed limit for most residential neighborhoods as far as I know. 30-40 KM suggested painted lines, which is exactly what is going on here. I’d also note having been to Copenhagen that they have curb separated bike lanes almost throughout the city–almost regardless of speed limiit. However, in central Copenhagen I don’t see how you could ever drive much more the 35-40 MPH anyway. Dave, yeah. Got better, but definitely a few rides have left their mark. However far less chance of catastrophe. I don’t want bullies to rule. It’s no doubt a pleasant form of exercise, but safer? My friends who MountainBike regularly seem to have FAR more accidents than do I, and not just cuts and bruises. It’s been at least 20 years of daily riding since I’ve touched down on a street. Mountain biking in nature is perfect when one is biking for recreation and exercise. But most off road trails don’t take me to work, or the grocery store or library. Here in Portland OR we have certain ‘Neighborhood Greenway’ streets designated, which have lower speed limits, a combination of speed bumps and cross-traffic stop signs, and do not have bike lanes. While sometimes these routes are a little less direct, they are pretty friendly for biking where you can usually take the lane. @Curt – funny you mention Neighborhood Greenways, I’m writing a post on them now. I think they send a much better signal to the community than painting a line on the side of a quiet neighborhood street. From what I’ve seen so far it seems like a good solution. @Curt failed to mention that there are no residential/neighborhood streets @25MPH or lowers in Portland that have bike lanes. Sharrows are more prevalent on those. The Neighborhood Greenways are most often designed for and used by bicycle commuters. That’s also the way it’s done in Berlin, Germany with many bike routes: Normal smaller streets without bike paths are designated as bike routes where cars are only allowed to go 30 km/h or are only allowed for residents. They feel safe, let you breath fresher air and are almost as fast as the bike path on- and off-road along the main streets. I knew it! A longstanding observation (complaint?) of mine had been that, on the street where I work, which has parking and lots of intersections with smaller streets there tend to be a lot of risk from cars trying to pull out into the main Blvd and not seeing cyclists, who tend to be pushed up against a row of SUVs by the bike lane. I’m not convinced, but I feel your pain. It really depends on what you mean by “bike lane”. If all the town is doing is slapping some paint onto an existing road then that isn’t too helpful and, yes, can be dangerous. The better solution is to build more space for a bike lane. That’s not too expensive when you are building a new road, but very expensive when retro-fitting an existing road. So you tend to get bike lanes where they are cheap to install rather than where they are needed. That’s the problem. @Brad – more width doesn’t solve the main problems though. It only does more to make new riders “feel” safe but extra width might actually make the left and right crosses worse. It’s the so yearned for segregation that causes problems. Safety is not the only value of bike lines. In heavy traffic, I like that I can skip to the front of the line at a red light and more easily pass vehicles on the inside. Do you have a link to the Belgium study you cited? I’m curious to read more details about it. @David S – I linked to it in a comment below. I feel every drawback you describe multiple times every day. In Manhattan, the roads with separated bike lanes are a huge pain. They are the spot where pedestrians know they can walk without any chance of being hit by cars. I slam on the breaks every few blocks because someone jumps out without looking. They also make for more dangerous left turns on streets that don’t have left arrows. They also slow me down due to the dangerous turns, the pedestrians, and the shortened lights for the streets with left turn arrows. I ride down ninth avenue (down hill) at about six or seven streets per red light cycle and ride up tenth (slightly uphill) at about 12 streets per red light cycle. Ninth avenue has a separated bike lane. Tenth has me among the cars. I have been yelled at twice this week to use the bike lane, in one case, from a car that was trying to push me off the road on Tenth Avenue (where again, there is no bike lane) and once going across town by a car that was stopped, but didn’t like that I was riding on the right side of the street pass cars when there is a painted line on the left side (that had a cab sitting in it). Excellent points. Bike lanes are worse than a placebo. They placate fears of being hit by same-direction traffic, to some degree, but arguably actually increase risk to such crashes, and they encourage edge riding which leaves the cyclist vulnerable to the more common crashes involving crossing traffic (right hooks, pullouts, left crosses). Real safety and comfort in riding anywhere comes from using the full lane by default. Thankfully, Bikes May Use Full Lane signs and sharrows are guiding cyclists to do this, and more and more are learning and reaping the benefits not only on roads so treated, but on all other roads too. The norm of edge riding is shifting to the norm of full lane use. Hallelujah! Hi Dave, could we have a reference for the Belgian study please? Thanks. Another Copenhagen study, Jensen S., “Bicycle Tracks and Lanes: A Before-After Study” found these things increased crash rates. But Jensen still favors them because he thinks the pollution reduction and public health benefits are worth putting cyclists at more risk! Good post. And it doesn’t even address the cost. If in many instances there is only a little benefit, or no benefit, how much are we paying for that benefit? Don’t forget the Door Zone!!! In Kenosha, WI, we have all of the above except protected bike lanes. Where am I most comfortable riding? On the roads without bike lanes and with traffic signs that say “Bike rider may use full lane”. When I’m forced into a bike lane (I have a difficult time being a scofflaw), I tend to be more timid in my riding. By the way, I’m a 64 year old grandmother who came back to cycling in 2013 and uses a bicycle almost exclusively from May 1 to Sept 30. The only reason I don’t disagree with every word of this is because it sounds like you’re talking primarily about bike lanes on suburban streets. Those you may be describing correctly. But bike facilities on urban streets with businesses and destinations on them absolutely need bike facilities, both for bike safety and as traffic calming. Ideally, we’d narrow the street substantially and add segregated cycle tracks, but that’s super expensive and can’t really happen unless the street is being completely rebuilt. In the meantime, buffered, or even better protected, bike lanes are part of making the streets safer for cars, bikes and pedestrians in the city. So, Adam, it sounds like we mostly agree as difficult as it might be for you to admit that. It sounds like the area where we might have disagreement is where on the continuum is the optimal point or what situations warrant what type of solution. Thanks for commenting! As a Dutch person your last two paragraphs horrify me. You should really visit Europe or specifically the Netherlands, because we got this stuff figured out ages ago. Your photo is so old. First you can see it was taken with a digital camera. Look at the shadow. Then, it is probably in Denver in the early 2000s. Nobody would ever build something like that today. @Jean-Francouis – I took that photo on 5/8/2017 – about 19 days ago with my phone (Nexus 5x). This is one of 10-12 streets in my town where a bike lane is needlessly installed. You’re probably right that this facility might not be installed on a NEW street. I fear, though, that it might be something even worse for cyclists! Thanks for your comment. Dave, your comments are spot on. Here in Atlanta we are seeing all of these unintended consequences of bike lane-itis. Our Mayor has stated his goal of achieving the League of American Bicyclists’ top designation as a “Bicycle Friendly Community.” And thus they are on a quantity-over-quality approach to bike lanes. The more miles of bike lane, the easier it is to get certified “Platinum.” Meanwhile the condition of the streets–with or without bike lanes–continues to deteriorate. Broken pavement, glass, trash, kudzu. 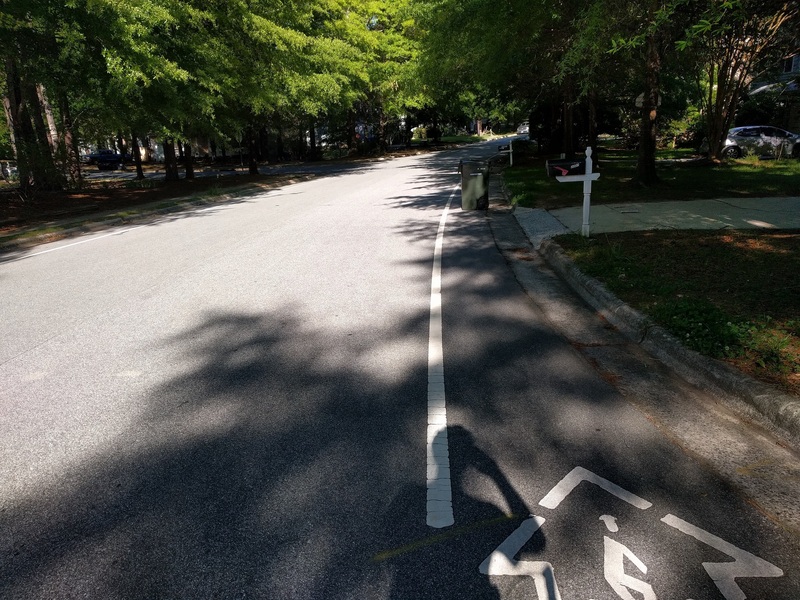 Interestingly I discussed this with a board member of the Atlanta Bicycle Coalition, and he said that they don’t want to make an issue out of the subject of road maintenance. Once the bike lanes produce all these new bicyclists, then we can ask the City to repair and sweep the streets. And that is why I no longer am a member of their group. Thanks for the comment, Tom. I agree there seems like there might be some perverse incentives with respect to how some towns fill out their application for the Bicycle Friendly Community. I’ve actually reached out to the org responsible for BFC to clarify this. I’ll write a post about their response. Painted bike lanes increase vehicle speeds. The bike lane supporters have campaigned for years on convincing the public that the paint makes roads safer. It does NOT! I’ve witnessed dozens and dozens of painted bike lanes all throughout the County and in every case, vehicle speeds increase. If cyclists want safer roads then lower the speed limit and problem solved. The paint pollution is all about job security and not about common sense. Why should stationary vehicles be inbetween moving cars and slower-moving cyclists? The more natural progression would be to have moving cars, slower moving cycles, then parked cars, and finally a curb. I always found it clumsey that cars are parked between two lanes for moving traffic. The great phrase is: cognitive overload. It is too complicated, especially when there is a lot of traffic, for people getting out of the car, and cyclists. And yes gettign “doored” is a problem, but parking cars in the middle of the roadway is silly. Previous PostPrevious Friendly and Charitable Light Rail Bet – Any Takers?